Don’t you feel like me that with the passing of Paddy as one of the last of his generation we have clearly entered a new age dominated by uncertainty; a lack of confidence in the values we once held as unquestionably true? These beliefs that bound us (in the West?) together for the latter part of the twentieth century are now unravelling at an ever-increasing pace. As we enter the End Game of the economic crisis, and as the decade of The Forever War rumbles on like the noise of a busy road in the middle distance – there only when we take the trouble to notice – we suffer a dearth of leadership and heroes of substance. Paddy and those of his generation had no such crisis of confidence; they served without question. They sacrificed themselves for the things they believed in, and they provided the leadership, entrepreneurship, creativity, and wisdom that helped rebuild Europe after almost half a century of ethnic and social strife, and destructive war. Maybe they also share some blame for the way things turned out, but who will step up now? In this considered profile, which prompted my rambling reflection, Paddy’s good friend Colin Thubron assesses his contribution, not as a warrior, but as a writer, and I think for the first time, reveals the torment of Paddy’s troubling writer’s block towards the end of his life. 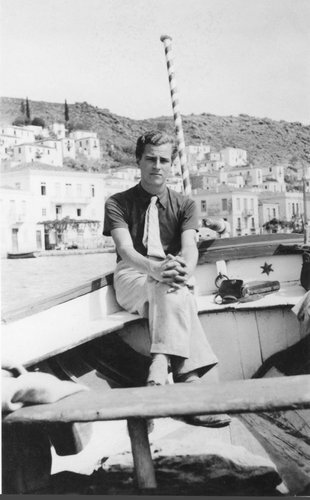 When Patrick Leigh Fermor died in June at the age of ninety-six, it seemed as if an era had come to an end. He was the last of a generation of warrior–travel writers that included the Arabian explorer Wilfred Thesiger, the controversial mystic Laurens van der Post, and the indefatigable Norman Lewis of Naples ‘44. Among these, Leigh Fermor shines with the élan and the effortlessly cultured glow of an apparent golden age. A war hero of polymathic exuberance, brilliant linguistic skills, and an elephantine memory, he was sometimes fancifully compared to Lord Byron or Sir Philip Sydney. Two pairs of books came to exemplify his achievement. The first pair—Mani (1958) and Roumeli (1966)—celebrated the Greece that held his abiding fascination and where he lived for forty-five years on a once-wild promontory in the Peloponnese. In Mani, especially, he described this backwater region as a world whose way of life had survived in a fierce and enchanted time warp. The land he depicted is barely recognizable now—tourism, he observed, destroys the object it loves—but it was less the Greece of classical antiquity that beguiled him than the spirit and folk culture of the hinterland: the earthy, demotic Romiosyne that he once contrasted with the Hellenic ideal in a playful balance sheet of the country’s character. In these, and in later books, the style was the man: robustly imaginative, cultivated without pedantry, unstoppably digressive, forgivably swanky, and filled with infectious learning. The impression—overflowing into elaborate footnotes and flights of learned fantasy—is one of omnivorous delight in the quirks and byways of history, art, language, genealogy, myth, song, superstition, costume, heraldry, and everything else that struck his fancy. His literary models were Norman Douglas and Robert Byron, but his writing was more vivid than the one, more kindly than the other. Despite the richness of his prose (occasionally slipping into purple) he forged an illusion of intimacy with his readers, as if they were sharing his mind in the moment of writing. But in fact his manuscripts were worked, reworked, and reworked again with such painstaking perfectionism that his publisher (the benign Jock Murray) often had to reset his galley proofs wholesale. The apparently natural flow of words was in reality a densely worked choreography, which came at cost. Fifteen years ago, swimming in the Ionian Sea beneath his home, where nobody could overhear us, Paddy (as friends and fans called him) suddenly confessed to me the writer’s block that would plague the rest of his life. The expectations of a now-avid public, and his own obsessive perfectionism, were taking their toll, and he could not overleap this cruel impediment. I remember him strong into old age. He swam every morning, with a sturdy breaststroke far out to sea, the tattoo of a twin-tailed mermaid glistening on his shoulder. He still kept up a striding march in the Taygetus foothills, where he and his wife Joan had designed their own house above the ocean. It was a place of “mad splendor,” he wrote. Its sitting-room library—bookshelves banked nine feet high—opened onto a vista of cypresses and the Messenian Gulf, and was flagged with the greenish stone of Mount Pelion. In the afternoon Paddy would disappear into his study to confront—or escape—the demons of his failed writing, and would emerge to the liberation of ouzo or whiskey, generally to report some arcane piece of research—that the Huns wore stitched field-mouse skins, perhaps—or to share a passage of Ovid. We dined in the monastic half-cloister he had built beside his home, and once we visited the tiny, red-tiled Byzantine chapel where—five years before—he had buried the ashes of Bruce Chatwin. The conflict between a natural gregariousness and the solitude of writing never quite resolved for him. In a short, intriguing study named A Time to Keep Silence (1953) he recorded his sojourn in three great French monasteries. He described this retreat not as a religious exercise, but as a need for a haven for writing, and the nature of its cleansing—”the troubled waters of the mind grow still and clear”—remains suspended like a question mark in the oeuvre of a man to whom self-revelation seemed indulgence. The second pair of books, which established Paddy’s primacy among travel writers, must be among the most extraordinary ever written. In 1933, as a youth of eighteen, he left England for a journey that would take a year and a half. As “a thousand glistening umbrellas were tilted over a thousand bowler hats in Piccadilly,” he set out to walk to Constantinople (as he nostalgically called Istanbul). Walking stick in hand, a copy of Horace’s Odes in his rucksack, he pursued a meandering course up the Rhine and down the Danube, across the Great Hungarian Plain, into Romania and through the Balkans to Turkey. It was almost forty-five years before he published the first part of this journey, and another nine years before the second. A Time of Gifts (1977) and Between the Woods and the Water (1986) represent prodigious feats of memory. They record the rite of passage of a precocious, exuberant young man as he encounters the peoples and languages of a Middle Europe now littered with obsolete names: Bohemia, Transylvania, Wallachia. His story must have become the dream journey of every enterprising and footloose adolescent. Inevitably the accuracy of Paddy’s memory was questioned, and he was frank about occasional imaginative license and conflation. (His first diary was stolen in Munich, a solitary last one recovered years later in Romania.) Certainly his recall was extraordinary. I remember the first time we met (by chance), when he quoted verbatim from my first book passages that I had myself forgotten. A year before his death we chanted verses from the Rubáiyát of Omar Khayyám together in an antiphonal competition (which he won). His urge to describe his epic journey more than forty years after its end was a deeply natural one. He was revisiting his youthful persona with the judgment and knowledge of maturity; yet in a sense he had remained unchanged. Despite his sophisticated learning, he retained an almost boyish innocence, as if the troubles of the modern age had bypassed him. In the Peloponnese, where he settled to live in the 1960s, he had remained in thrall to a more ancient, rooted culture than that of the urban West. The final volume of his proposed trilogy—carrying its author through the Balkans and down the Black Sea coast to Turkey—became his tormenting and elusive project for the next quarter- century, and was never completed. Some near-finished version, however, survives him, and will eventually be published. With his youthful trek done, Leigh Fermor’s career took off into near fable. Caught up in Greek unrest, he joined in a triumphal royalist cavalry charge against wilting Venizelist rebels. In Athens he fell in love with the artist Princess Balasha Cantacuzene, twelve years older than him, and lived with her in Moldavia for over two years, before World War II recalled him to London. As a fluent Greek speaker he was recruited by the Intelligence Corps, and sent as a liaison officer with the Greek army first to Albania and finally to Crete, where he survived the brutal German invasion. For almost two years, while an officer in the Special Operations Executive, he lived disguised as a shepherd in the Cretan mountains, organizing the gathering of intelligence. Then, in 1944, occurred the exploit that—more than any other—was to burnish him into legend. He and his fellow SOE officer Stanley Moss dreamed up a scheme of harebrained bravado. Dressed in stolen German uniforms, with a party of Cretan guerrillas, they ambushed the car of General Heinrich Kreipe, the German commander of occupied Crete, kidnapped him, and concealed him under the back seat. Moss took the wheel, Paddy donned the general’s cap, and together they drove through twenty-two checkpoints to emerge on the far side of Herakleion and march Kreipe for three weeks over the mountains, to be picked up by motor launch and taken to Egypt. —and when I’d finished, after a long silence, he said: “Ach so, Herr Major!” It was very strange. As though, for a long moment, the war had ceased to exist. We had both drunk at the same fountains long before; and things were different between us for the rest of our time together. This precocious kidnapping was later reimagined in a lackluster movie named Ill Met by Moonlight (1957) with Dirk Bogarde playing Paddy. But there were other exploits too. Paddy had already engineered the defection of the Italian General Angelico Carta from Crete; and he was due to undertake a near-suicidal mission to Colditz when the war ended. His upbeat account of these events was tempered by regret. He had planned that the abduction of Kreipe be bloodless, but his accompanying Cretan partisans slit the chauffeur’s throat, and rumors of grim German reprisals for the abduction have never quite died down. Above all, Paddy’s accidental shooting of one of his fellow guerrillas may have stained his memory of the whole period. On June 16 Leigh Fermor was buried back in the English countryside, attended by an Intelligence Corps guard of honor, to lie beside his wife Joan, his dear comrade since 1946. This was, in a sense, fitting. For in certain ways he was exemplary of a wartime Englishness now almost gone, whose more dashing qualities merged seamlessly into the hardy stylishness of Greek leventéa. To those who knew him, his books are hauntingly redolent of his sensibility. His conversation was irrepressibly warm and inventive far into old age, moving from arcane anecdotes to fanciful wordplay or bursting into polyglot song (sometimes singing the lyrics backward). His friends ranged from Deborah, Duchess of Devonshire—last of the six legendary Mitford sisters (his correspondence with her was published in 20082)—to early acquaintance with a raffish interwar bohemia and his own great predecessor, the travel writer and aesthete Robert Byron, whose borrowed rucksack he bore across Central Europe as a youth. This was typical of his boyish resilience. In the field of travel he evoked both the youthful wanderer who discovers another world and the avid scholar who melds with it. His prose was too rich and elaborate to be a safe influence on others (although a few have tried); but he brought to the genre not only the distinction of his densely brilliant books, but his innate dignity, ebullient mind, and capacious heart. 2The correspondence, In Tearing Haste , edited by Charlotte Mosley, was published in the US by New York Review Books (2010), which has also republished the other books by Patrick Leigh Fermor mentioned in this article, as well as The Traveller’s Tree . This entry was posted in A Time of Gifts, A Time to Keep Silence, Between the Woods and the Water, In Tearing Haste, Mani, Paddy's Friends, Profiles of Paddy, Roumeli, Volume Three - The Broken Road and tagged Colin Thubron, Crete, Deborah Devonshire, Greece, Joan Leigh Fermor, Major General Heinrich Kreipe, Patrick Leigh Fermor, Peloponnese, SOE, Special Operations Executive, William Stanley Moss on September 17, 2011 by proverbs6to10. Wallachia (as well as Vallachei) is a westernised name and it comes from http://en.wikipedia.org/wiki/History_of_the_term_Vlach . What concerns the difference between Transilvania and Moldova, from ALL the points of view, this comes from the austro-hungarian influence in Transilvania and the russian influence in Moldova, Iasi in particular. I am really for using the original NAMES of the languages in every country. Why should the world know about Wallachia or Vallachei, when the region is formed of TWO provinces. This is what is creating the confusion. I was born in Romania, grew up there, went there to school and University for 33 years. And the history of Transilvania was extremely turbulent and still is today, in the quiet. Come on, Chris and Tom – this is slightly unedifying in the circumstances of our hero’s recent demise. I’m sure he wouldn’t have approved of lengthy wrangling. PS Please enlighten me: what is the reference to in your email address ? There is a wonderful article in the latest New York Review of Books on Paddy. They record the rite of passage of a precocious, exuberant young man as he encounters the peoples and languages of a Middle Europe now littered with obsolete names: Bohemia, Transylvania, Wallachia. He links Middle Europe with Wallachia, which is certainly in the Balkans. The “Visegrad countries” of Poland, Hungary, the Czech Republic and Slovakia definitely fall within Central Europe. That’s the Economist’s view which I have always shared. Poles, Hungarians, Czechs and Slovaks do not like being described as Eastern Europeans (a term from the Cold War), any more than the Balts. After this the term gets fuzzy. I favour the view that Mitteleuropa is more of a cultural area than a strictly geographical one. That is to say the majority of countries in the former Austro-Hungarian Empire (including Transylvania and Bukovina) are Central European. But the real clincher is religion. The Central European countries have a Catholic heritage (and, before the Saxons and Swabians left Romania, a Protestant-Lutheran tradition) while Balkan countries tend to be majority Eastern Orthodox. Have you ever asked your friends in Cluj or Timisoara whether they are in the Balkans? Well, many are Orthodox or Uniat so where does that leave us? I don’t think they have a problem with the Balkans, but then Transylvania is a quite different place to Iasi!!!! The academics and intellectuals I know from those parts are adamant that they are Central European, Orthodox or not. (We’re getting fuzzy again.) I recently spent a week of intensive travel through Transylvania with my daughter. I’ve been travelling in Transylvania since 1977. From Iasi, it’s like going to another country. We ain’t going to agree so let’s leave it there. Bohemia, Transylvania and Wallachia are hardly “obsolete names”. All are very much in use today. The Czech constitution from 1992 refers to the “citizens of the Czech Republic in Bohemia, Moravia and Silesia” and proclaims continuity with the statehood of the Bohemian Crown. Bohemia is not currently an administrative unit of the Czech Republic. Instead, it is divided into the Prague, Central Bohemian, Plzeň, Karlovy Vary, Ústí nad Labem, Liberec, and Hradec Králové Regions, as well as parts of the Pardubice, Vysočina, South Bohemian and South Moravian Regions (Wikipedia). Bohemia, Moravia (and Silesia?) are used today to contrast the Czech Republic with Slovakia. Present-day Romania is divided into three provinces: Transylvania, Wallachia and Moldavia. Transylvania (Ardeal in Romanian, Siebenbuergen in German, Erdely in Hungarian) was awarded to Romania at the Versailles conference at the end of the First World War. Of course one needs to explain to those steeped in Bram Stoker and Hollywood and Hammer films that Transylvania is a real place. Wallachia is certainly an ancient name in English. One of its earliest uses can be found in Chaucer. His mercenary Knight fought battles in “Vallachei”. As for Moldavia (not mentioned by Thubron, but which features strongly in Paddy’s work) it is best thought of as Western Moldavia (in Romania) and Eastern Moldavia (the present-day Republic of Moldova). Confusingly, when speaking English, most Romanians also use the term Moldova, the translation of Moldavia, to refer to Romanian Moldavia. As for Middle Europe (Thubron’s translation of the German Mitteleuropa), I think Central Europe is a better English translation. Today, the western part of Transylvania (especially Timisoara, Cluj and the medieval German towns) is definitely in Central Europe. Woe betide you if you describe these cities as being located in the Balkans! Chris – I think what he means is that whilst they do indeed still exist as entities, they are now consumed into larger states. In the past they were independent kingdoms and those evocative names bring a sense of mystery to those of us in the West. Typically one would now say Cluj is in Romania rather than Kolozsvár was in Transylvania. And I disagree on the Balkan part. Romania’s startegic position on the edge of the Balkans (a route into for Russia) means that it is so closely intertwined that it is Balkan.